The present Geylang Serai Market & Food Centre espouses the heritage of a number of markets in the Geylang Serai area that goes back to the pre-World War II days. There was a make shift hawker shelter at the entrance of Kampong Geylang Serai, opposite Joo Chiat Road, which the municipality erected some time before 1930. The locals called it Geylang Serai Market. Although it was closed soon after 1930, hawkers continued to ply there and the “market place” continued. When the Japanese Occupation started, the grounds of this market space was turned into an amusement park. After the war, the makeshift street hawker-market area made a comeback. By the early 1950s, the residents of the nearby Kampong Melayu started to visit this “Malay” market frequently for their marketing needs as they had no market of their own at Jalan Eunos. From 1952, the government turned the area into a “Changi Trade Fair”, which was intended to be Singapore’s largest trade and industrial fairground. Upon completion, it was christened the Great Eastern Trade Fair. However, it started faltering from 1954. The site owners opened the New City Cinema within its grounds in October 1957 in the hope of bring new life to the site. It nevertheless closed a year later. Interestingly, it was not because the area was not well patronised. The fact of the matter was that the Malays of the district preferred to visit market stalls around Great Eastern Park. The great leap forward came in 1962 when the government announced the start of the Geylang Serai Development Scheme which was the first step in the urban development of the district, and this included the building of a proper market on the site of now defunct Great Eastern Park. PM Lee Kuan Yew himself laid the foundation stone of the new market in August 1963. 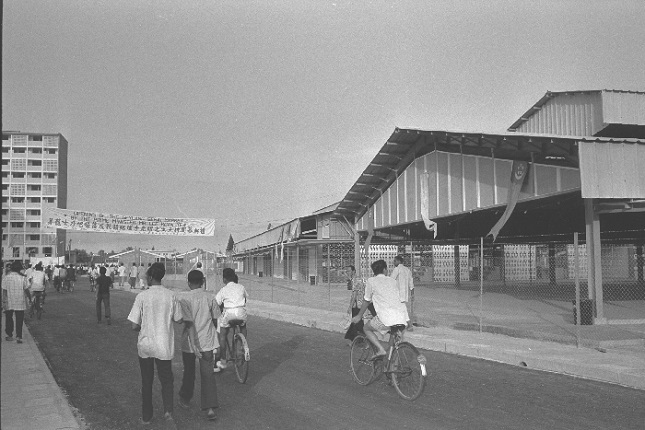 When this covered market was completed in 1964, the estate had a simple wet market under a zinc roof. The locals called it Pasar Geylang Serai. Even before the completion of the market, the Geylang Serai was already a Malay cultural heartland, where the street hawkers had formed a “permanent bazaar” where many Malays would visit every festive occasion. Naturally, the Malay Stallholders Association of Geylang asked the government for a piece of ground next to the market to set up a Malay bazaar. The opening of the market, unfortunately, coincided with the 1964 racial riots. As a result, many of the street hawkers who were supposed to have moved into the new Geylang Serai Market decided to give it a miss for fear that they may be attacked. So, Geylang Serai Market became a white elephant for some years, while the street hawkers continued to operate all along the streets around. Over time, most of the market stalls were eventually occupied. In 1975, almost a decade after opening, Geylang Serai Market underwent its first upgrade. At this point, the market had three sections: the Eating House, which was considered the place where Singapore’s largest variety of Muslim food could be found, the Market proper (wet market) and the textile and sundry goods area, where many of the stalls were owned by Malays or Indian Muslims. In 1978, the stalls in the market doubled when market produce and cooked food stalls from Haig Road Market were shifted there. By this time, the Geylang Serai Market had become the main market in the area as the nearby Changi and Joo Chiat markets had already closed. Its growing popularity had seen it outlive its neighbouring markets. In the early 1980s, the market attracted shoppers during Hari Raya, and not from all parts of Singapore but also from across the Causeway. The turning point came in 1984 when the government announced plans for the conservation of Geylang Serai’s Malay cultural heritage with the development of a Malay cultural village next to Geylang Serai Market. When the construction of the Village commenced in earnest, the market underwent renovation. When the Village faltered, the market was redeveloped independently. In 2006, the market was torn down and rebuilt. It was completed in 2009 and the old stallholders returned. One of the original intent in rebuilding the whole market was to make it more attractive and accessible to tourists. This $18.2 million market building is shaped like a Malay Kampong house. The completion of the new market in 2011 coincided with the closure of the Malay Village, and this made the Geylang Serai Market one of the bigger draws of the area. Many still visit the market to get their Malay bajus and batiks which could be gotten on the cheap. This double-storey market and hawker centre is unique for its Malay kampong design that retains and exudes its cultural heritage.